Are applicant tracking systems and resume-filtering technologies hindering your job search? Here's how to beat them. You've got all the right skills. Your resume shows a clear progression of advancement through your career, with a long list of accolades and accomplishments. You work well with others, but can excel independently. You've solved problems and increased revenue for your last few employers. You interview well -- or at least you would if you could get an interview. So what's the problem? You might be at the mercy of an applicant tracking system (ATS) and resume-filtering module -- technology that scans incoming resumes for job-specific keywords and "grades" them on a scale of 0 to 100. If your resume isn't scoring high enough, you could be excluded before your application ever makes it before human eyes. There are a few ways to get around these solutions, the first one is aimed at circumventing the resume-filtering module that might be unwittingly screening you out, according to Rick Gillis, job search strategist, consultant, speaker and author of Job! and Promote! Your work doesn't speak for itself. You do. Gillis encourages his clients to use these "guerilla" tactics to give them a better shot at landing an in-person interview and a job by making just a few quick formatting tweaks. "Yes, we're gaming the system. Really, we're leveling the playing the field. I know that my clients can land jobs if they can get past the machines and can prove themselves in person. That part of the job search and interview process is up to them. But as a consultant, it's my job to help them make the difference between getting that phone call, creating that touch point, and moving forward," Gillis says. First, and most importantly, there are some hard-and-fast rules, even in these guerilla tactics, Gillis says. Do not lie, do not misrepresent yourself or your skills, and do not claim experience, traits or knowledge that don't represent you, he says. "One thing clients ask me is, 'If I see a job and I meet most of the criteria, but not all, should I even bother applying? ', and I tell them that a job description posted by a hiring company is a wish list. These companies would love to have 100 percent of these qualities and skills, but if you have 70 percent to 80 percent, go ahead and apply. But don't you dare put anything in your resume or your application that you can't speak to in an interview. Sure, you'll get past the machines, but you'll be branded a dishonest, deceitful and untrustworthy person, and you'll never land a job, there or anywhere," he says. That said, most legacy ATS use a resume-filtering module that scans and grades resumes, with points given for each match in keywords and terms between a resume and a job posting, Gillis says. 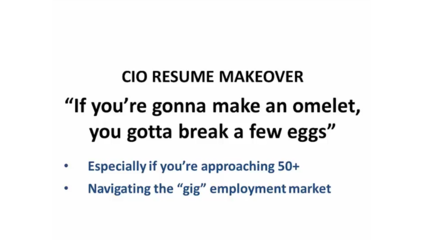 Because many recruiters and hiring managers are strapped for time, they'll often set the software to scan only the first page of your resume, so it's critical that all relevant keywords appear on that first page, Gillis says. The best way to do this is to keep a running list of keywords relevant to the jobs you're seeking, and that include jargon, lingo and industry-specific language and add to those the keywords from the job to which you're applying, and place them in 8-point font at the bottom of your resume. That's all there is to it. "Keep a running list of your generic keywords that you use with your peers. Whether you're a journalist, an attorney, an IT professional or a plumber, there are terms and language that are specific to your industry; that shows you're an "insider." If the terms are not already on your resume, you must artificially insert them, and the best way to do this is putting them all in a separate section at the bottom of the resume. Remember, you're not doing this for the humans, you're doing this for the machines that will 'see' your resume first," Gillis says. That includes keywords that aren't job-specific, Gillis says. Don't forget to include terms that might give you an edge, including your geographic location, your education and other more personal identifiers that are included in the job description; "college degree preferred" and "southwest Houston" are just as much keywords as "senior Java engineer" or "database administrator," he says. Another trick: have a short-form and a long-form resume, Gillis says. The short-form resume should be accomplishments-based, and should avoid fancy charts, graphs or graphics, that can often be kicked back by legacy resume-filtering modules, Gillis says. It should include a header, a "seeking statement," and, if possible, you should use the name of the company in this statement. Why? Because within Taleo, one of the most popular ATS packages, the solution automatically gives applicants points for using the company name in the application, Gillis says. "If you use the company name once, the Taleo system will give you a point. If you use it twice, you get two points in their system. If you want to see how it works, they're very open about the process; Taleo even has videos on YouTube that show how they eliminate candidates who don't know how to play this game," he says. In addition, include your most current skill sets and four -- only four -- accomplishments, each with a net result: revenue generated, deadlines met or exceeded, money saved, for example. Each should include the name of the company for whom you worked, your title, dates and your role. And that's all, he says. "All the extras, all the other details, should be saved for your long-form resume. That's where you can include charts, graphs, pictures and other elements. The short-form's the job-seeker's equivalent of when Oprah says, 'We're going to take a break, but when we come back, I'll teach you how to get $1 million!' You're not going to change the channel now, are you? This is what you're doing -- this is how you're playing the game. You want the hiring manager to call you and say, 'I am looking at your resume, but I would love to see more information,' and that's why you have a rich, robust long-form resume. Then you can say, 'Great! I will send you my long-form resume and some additional information, and we can set up an in-person conversation,'" says Gillis. Of course, this assumes that you're missing out on interview and job opportunities based on resume-filtering technology's shortcomings, says Todd Dean, chief marketing officer and co-founder of mobile employment platform Wirkn. There's always the chance you're just not a fit for that role or within that company for cultural reasons. "Sometimes, ATS and resume-filtering technology seems like it doesn't work in your favor because if you need to game the system, you might not be a good fit anyway. Sure, perhaps you can land an interview or even a job, but most companies' culture works like an immune system in that, if you're going against the cultural grain, the entire system can turn against you and you'll quickly burn out or be let go -- that's a waste of your time and the company's time," Dean says. If you want to make sure you're landing in a job and at a company where you can thrive, you can work on beefing up your networking skills and generating referrals from friends, family and former colleagues at organizations that are appealing to you, Gillis says. "The majority of jobs nowadays are found as a result of networking, so there's a great chance your professional network will be the source of that next touchpoint. Don't neglect networking and social media," he says. Recruiters and hiring managers do research on candidates before they reach out to gauge interest. Leela Srinivasan, CMO, recruiting and ATS software solution company Lever recommends that candidates do the same for hiring managers and recruiters. They should work to find out which ones work with companies and roles they would be interested in. You want to make yourself as enticing as possible to them and up the chances they'll see you as a fit and reach out for an introduction before you even have to deal with an ATS solution, she says. "The best recruiters do a lot of research up front, before they even reach out to a candidate, to understand what skills, experience, passion and interests a person has as a human being -- not just a resume that matches. The object of the game is to make yourself a person of interest, a known entity. Once a recruiter has those data points, they are the most determined people on the planet, and they will politely and persistently reach out until they get a response, to start a two-way conversation," Srinivasan says. Knowing how recruiters and hiring managers work can help you apply this strategy to your own job search, she says. Identify what companies you'd want to work for, what particular roles you'd be ideal for, and then what experience, skills, passion and interests match up with those available at the company, she says. "You're looking for an in with an angle of relevancy. Then, within that broader scope, try and determine if there is a particular manager, recruiter or other person currently at the company you could get in touch with. If you have a specific company and/or role in mind, you should look at this as a long game, not a specific one-off shot at a job," Srinivasan says. You also can try and engineer a referral, as most companies today find their highest quality hires come on the recommendations of their current workforce. LinkedIn is a great resource in these cases, Srinivasan says, because it shows you wider connections than just your first-degree friends, family and colleagues. "So much of hiring today is about companies trying to bring in the best and brightest, rockstar talent, and in many cases, employees are incentivized for referring new hires. So, look around and apply the broadest possible lens to the connections you have at the company. Do you know someone who knows someone? Did you see a manager or an executive speak at a conference, or read a particularly eye-catching blog post? Anything that gives you a reason to connect is great," she says.